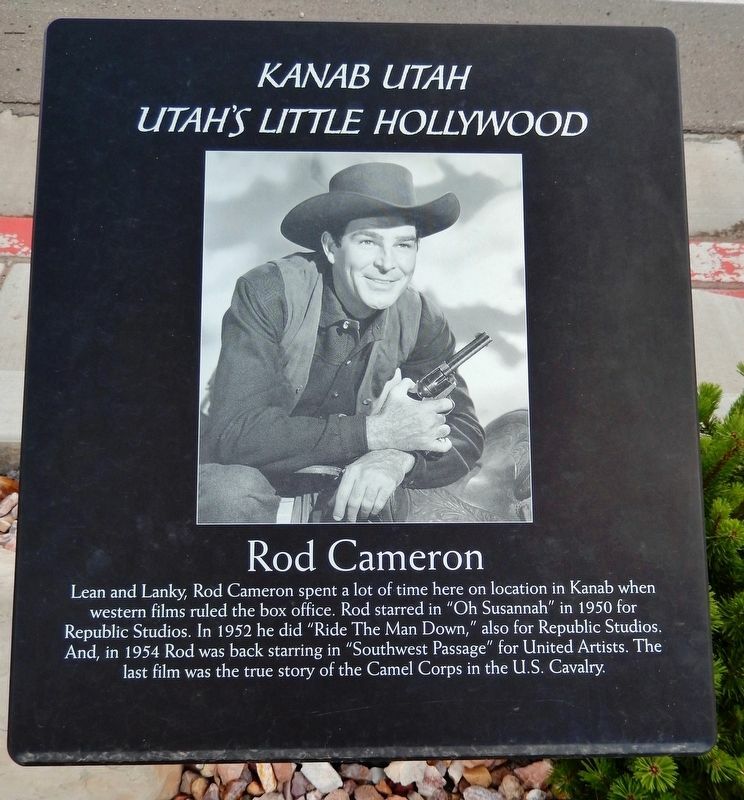 Lean and Lanky, Rod Cameron spent a lot of time here on location in Kanab when western films ruled the box office. 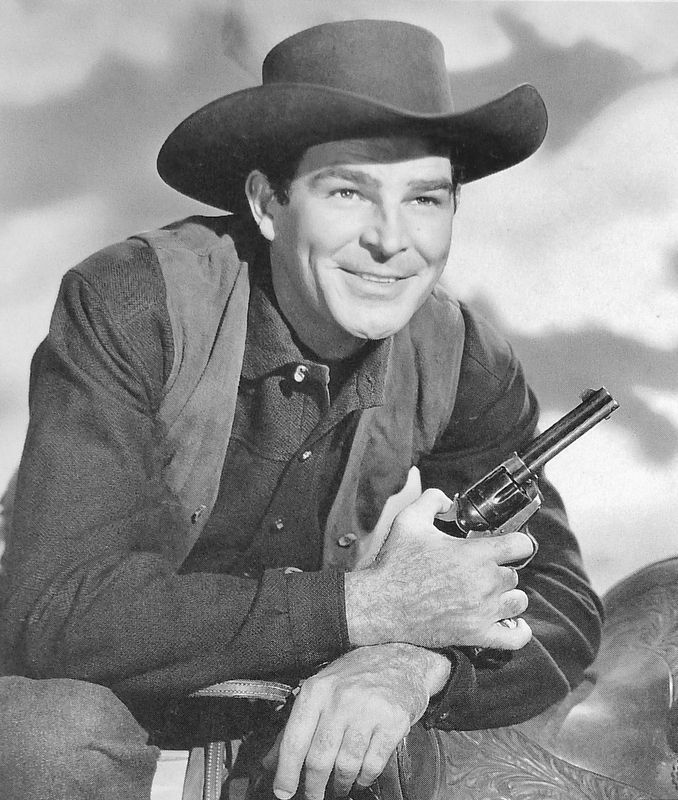 Rod starred in "Oh Susannah" in 1950 for Republic Studios. In 1952 he did "Ride The Man Down," also for Republic Studios. And, in 1954 Rod was back starring in "Southwest Passage" for United Artists. The last film was the true story of the Camel Corps in the U.S. Cavalry. Location. 37° 2.596′ N, 112° 31.591′ W. Marker is in Kanab, Utah, in Kane County. Marker is on South 100 East (U.S. 89) north of East 300 South, on the right when traveling south. Touch for map. Marker is located beside the sidewalk, on the west side of the street, in front of a service station. Marker is at or near this postal address: 288 South 100 East, Kanab UT 84741, United States of America. Touch for directions. 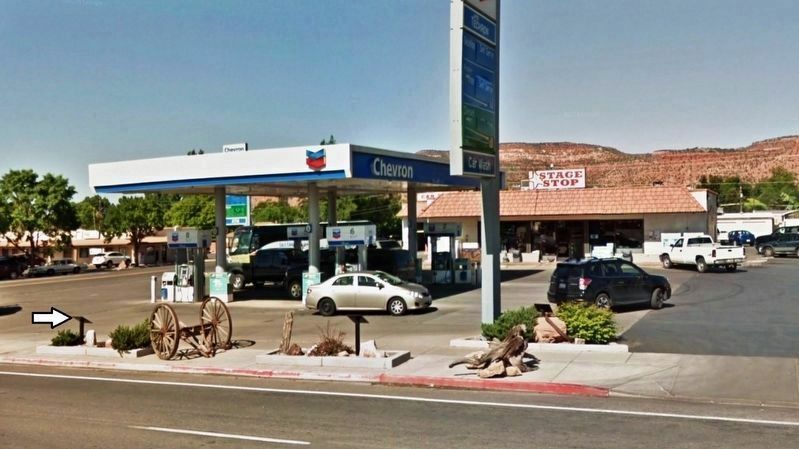 (within shouting distance of this marker); Dub Taylor (within shouting distance of this marker); Jack Nicholson and Will Hutchins (within shouting distance of this marker); Marty Robbins (within shouting distance of this marker); The Proud Rebel (within shouting distance of this marker). Touch for a list and map of all markers in Kanab. 3. Southwest Passage (Internet Movie Database). More. Search the internet for Rod Cameron. Credits. This page was last revised on March 7, 2019. This page originally submitted on March 7, 2019, by Cosmos Mariner of Cape Canaveral, Florida. This page has been viewed 69 times since then. Photos: 1, 2, 3. submitted on March 7, 2019, by Cosmos Mariner of Cape Canaveral, Florida. • Andrew Ruppenstein was the editor who published this page.